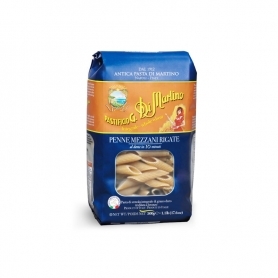 Di Martino Pasta There are 8 products. Widespread linguine format, rough, holds the sauces wonderfully. Typical Gragnano paste, bronze drawn. The rolled-up format is an invitation to the sauce, but for a definite scent of ripe wheat and characteristic sapid flavor, the fried cottage does not fear a simple pan pastry I suppose frisco and alleietello (Fresh parsley and garlic). Mixture of short bronze drawn pasta. Originally, it was customary among the Gragnano families not to throw the leftovers of different types of pasta. A hymn to the traditions of once. Intense flavor and full of grain, ideal for recreating the recipes of tradition. From unrefined semolina, dough drawn to bronze. Durum wheat wholemeal semolina paste processed according to the traditional method of the town of Gragnano. The rough surface holds the sauces well. Dynamic spirals with intense scent of grain to celebrate the true and genuine flavor of Gragnano's pasta. 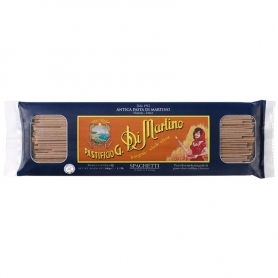 Durum wheat wholemeal semolina paste processed according to the traditional method of the town of Gragnano. "Giant" format to be served with homemade and full-bodied sauces. Also try stuffed. Typical Neapolitan format which gives its name to the homonymous first course of pasta with seafood sauce based on squid.